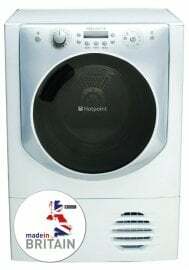 Hotpoint AQC9BF7I1 60cm Wide 9kg Ultima Condenser Tumble Dryer Polar Ice with selectable child lock, glass door and 7 level set & forget sensor drying. Also known as AQC9BF7I1, AQC9BF7I, AQC9BF7, AQC9BF, AQC. Display includes ?Time To End?